Keeping the traditions alive. The Californio Ranch Roping Club is not affiliated in any way with "The Californios" roping competition held in Reno, Nevada. and i was intrested in joining you guys. just wondering if you could send me more info and when the next ropin lessons are. The next roping is still in the planning stage. Once we have something put together it will get posted on here. We also have a yahoo email group that we use to communicate. I’ll send you an invite to join that and then you will get a email when we get something together. I’m planning on the roping this weekend. 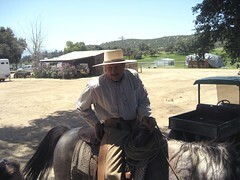 We (Jim and I) may not get away until late Sat or early Sunday so may only have one day to rope.